desert diva : Tic tac toe - today! Tic tac toe - today! 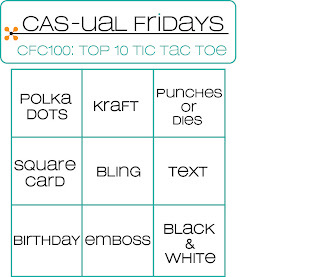 Firstly: a Big Congrats to the cas-ualfridays challenge with their 2nd Birthday! I started playing along with challenge 8 or 9 if I am not mistaken! Seldom missed a challenge...fresh inspiration weekly! Thanks Michele & the girl Fridays, you are the best! Yes, that's a tiny lens flare on the 'o', I added it in Photoscape... couldn't resist! so stinking cool! I love how this is so CAS yet has so much dimension! Well that just puts everything into perspective! lol! Love the green with the grey - so cool! What a truly unique card Hannelie, I don't think I've ever seen anything quite like this! Awesome job!!! What a cool card. You can hardly take your eyes off it. And the black with the green...priceless!!! How'd you do that? It seriously looks like I can reach right in to grab the sentiment (with the sweet little flare!). Wow! What a stunning card!! How did you create it? is it a stamp? ohhhh WOW, this is sooo cool! what a great dimensional effect! Wait, how did you make this?!? It's SO STRIKING! Especially since the square is not square ... love it!! So glad you joined the big celebration at CAS-ual Fridays, Hannelie! Whoa! This card is so cool! I can't stop staring at the text--simply brilliant! What a fabulous project!! Thanks for joining us for our big birthday bash! This is amazing!! You are a genius! Well, shoot, I'm not sure how I missed this, Hannelie, but thankfully (and deservedly) you won a Contender honor, which brought me to this post to congratulate you. HOW did you do this amazing card?? A digi? It is utterly fantastic and so unique. Take a bow!! WOW! Missed this one but it is so amazingly innovative. And your color choices are perfect. Put a bday sentiment on it and it's definite Gallery Idol material!